Path has continued its tradition of making its service small and intimate by adding video functionality to its app, limiting video memories to ten seconds only. When the photo sharing service launched, Path was an email-only friend service that allowed users to share photos taken in real-time with up to 50 friends. As users downloaded the app and got into the slick sharing process and the gorgeous design, the Path Team decided to allow photos taken previously to be posted, giving the option to import from the iPhone’s Media Library. 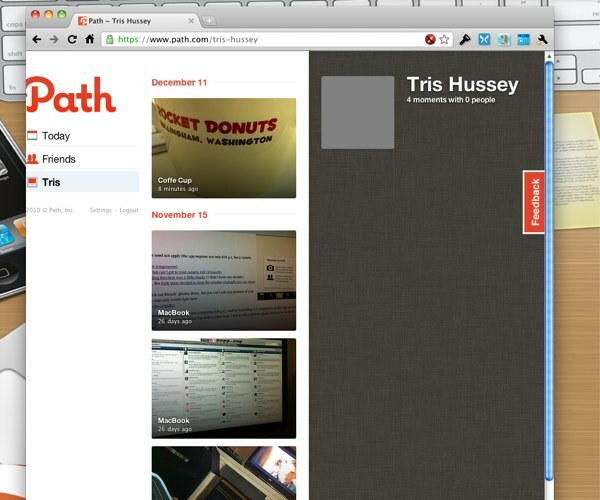 Path 1.2 adds Path Video, tagging videos with people, places and things, adding context to the media that people share. With Facebook and Address Book friend imports, the unnecessarily difficult email friend-adding process has been done away with and networks of friends can be built a whole lot easier. The new update also allows users to see all of the people tagged in their last three shared moments, as well as improved notifications which will alert a user in real-time when someone in their friends list updates.